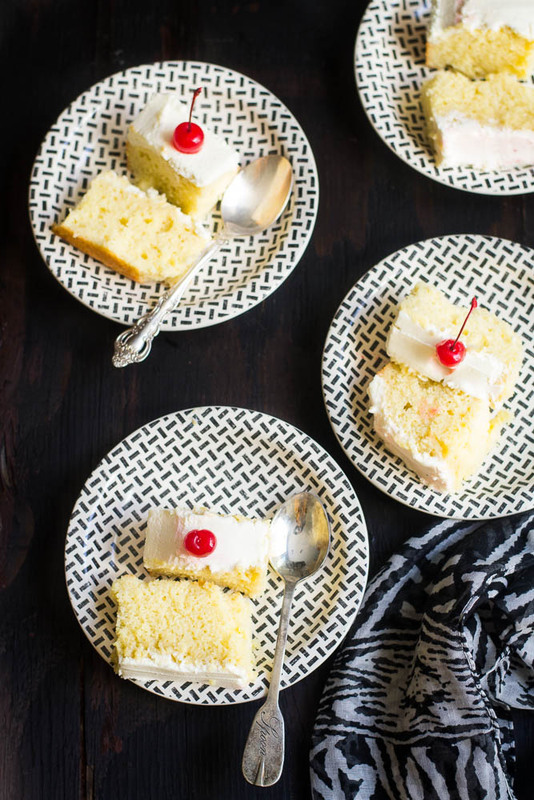 Today let me start with some Spanish words : Tres and Leches. Tres means three and Leches means milk. We are going to make a cake which is named with these two words - Tres Leches or three milk cake. 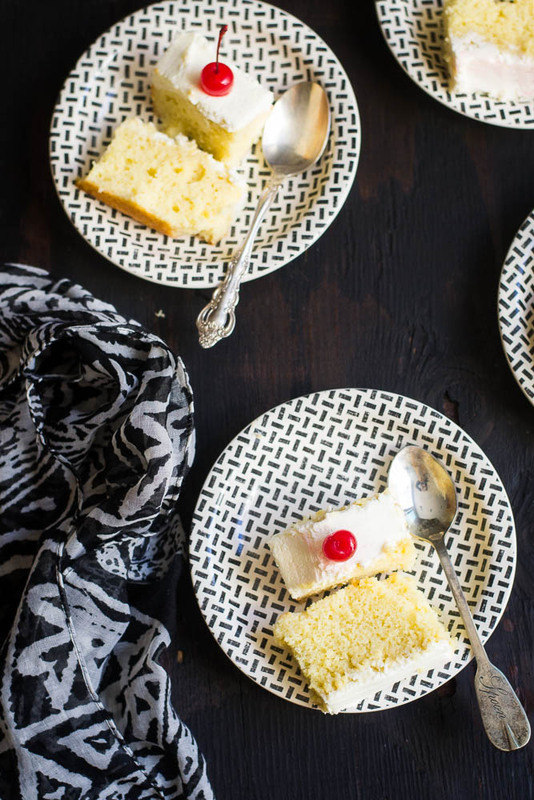 It's a sponge or a butter cake soaked in three different kind of milks: evaporated, condensed and heavy cream. Three forms of leeches or milks are poured over a baked cake. Though it is soaked in a mixture of these milks, it doesn't have a soggy consistency. Rather it has extremely dense moist, almost like a custard. 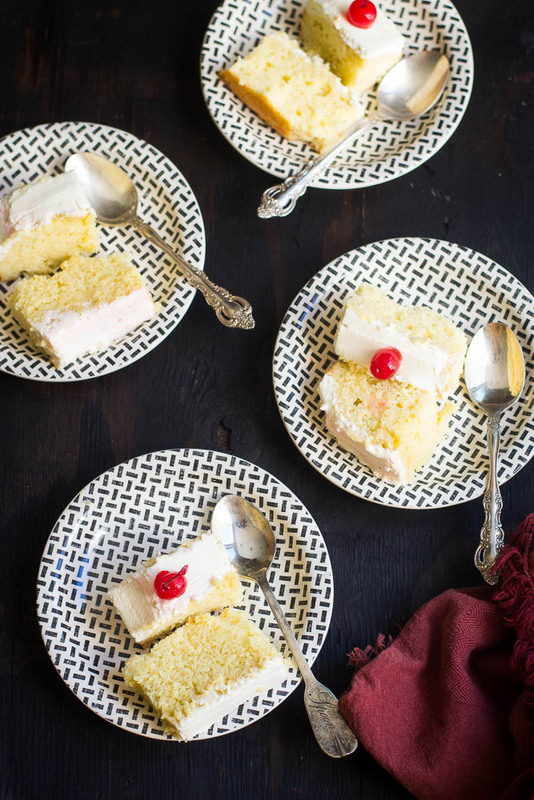 This cake is very popular in many parts of Central and South America, though origin of the Tres Leches cake is disputed. 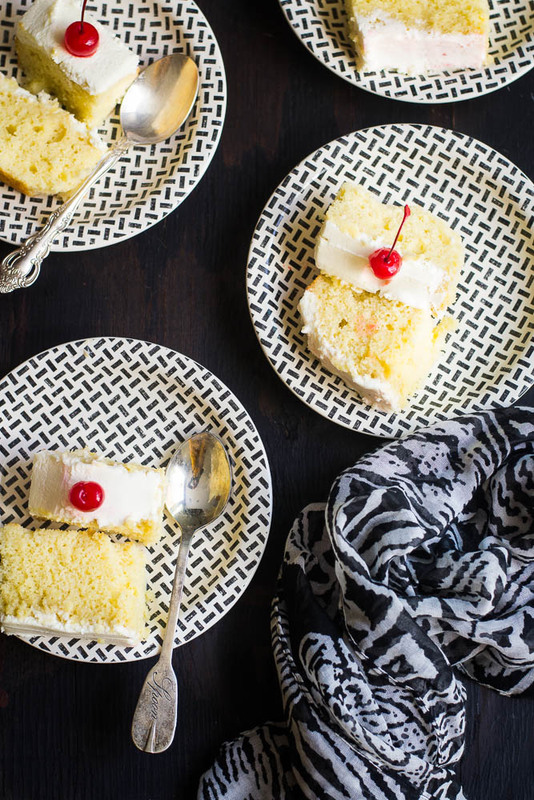 Nestle claims that they helped to develop the Tres Leches recipe during World War. But the idea of making a cake soaked in liquid is most likely from Europe, just like Tiramisu is from Italy or British Rum Cake from UK. I have tested this cake at several parties and every time I liked it more. So the plan was there in my mind for long time to give a try. Finally I could make it last weekend and it turned out well. Ensure you make the cake, well before you want to serve it. The longer it rests, the better it gets. The recipe is adopted from foodnetwork. It's very simple and super easy. Whoever knows to make butter cake or sponge cake easily can try it. This full cake was made for my son's friend group as a Diwali / Halloween treat. Soon I'ill make the second one! Heavy whipping cream : 2 cup. 1. Preheat the oven to 350 degrees F or 175 degrees C. Lightly grease a 13 x 9 x 2 inches pan and set it aside. 2. Combine the flour, baking powder and salt in a medium sized mixing bowl and keep it aside. 3. Put the butter into a big bowl or into the bowl of a stand mixer with the paddle attachment. Beat on medium speed until it is fluffy. 4. Decrease the speed to low and slowly add the sugar. Stop the mixer and scrape down the sides if needed. 5. Add the eggs, one at a time, and mix it well. Add the vanilla and again mix it to combine. 6. Slowly add the flour mixture to the egg-butter mixture and mix it well. Transfer the batter to the prepared pan and spread it evenly. 7. Bake it for 20 to 25 minutes until the cake is slightly golden and a toothpick inserted in the center of the cake, comes out clean. 8. Once it is done, let the cake cool down completely. Turn the cake out on a rimmed platter and poke the top of the all over with a fork or a toothpick. Again allow the cake to cool down. 9. Take the evaporated milk, sweetened condensed milk, and the half and half in a medium bowl and whisk together. 10. Once it is well mixed, pour the mixture over the cake. Let it sit for overnight and put it into the fridge. The cake will soak up the glaze. 11. Place the mixing bowl and whisk attachment in the freezer for 15 minutes. Then put the cold whipping cream, vanilla extract and sugar into the bowl and beat until stiff peaks form. 12. 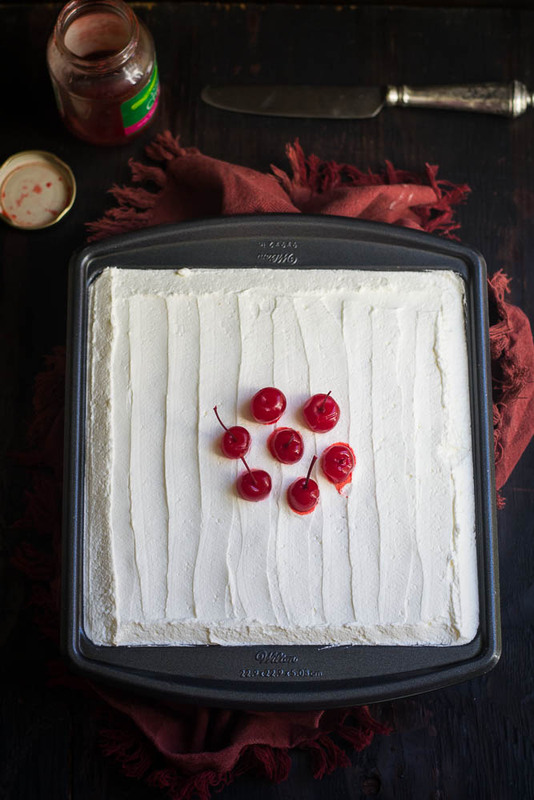 Spread the topping on to the cake, top with cherries and allow it to chill in the refrigerator until ready to serve. 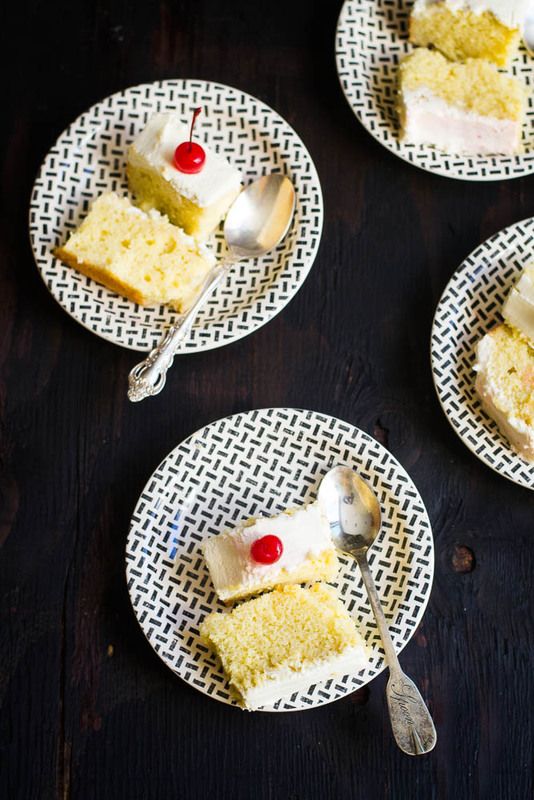 Note : The cake is best when it is baked a day prior to serving and to let the cake soak up overnight in the refrigerator. 1. Preheat the oven to 350 degrees F and Lightly grease a 13 x 9 x 2 inches pan with butter and set it aside. 2. Take a bowl and mix all purpose flour,baking powder and baking soda. 3. In another bowl Cream the butter, add condensed milk, milk and vanilla extract and Mix it well. 4. Pour the wet ingredients to the dry flour mixture little by little and Mix them well. 5. Transfer the batter to the prepared pan and spread it evenly. 6. Bake it for 20 to 25 minutes until the cake is slightly golden and a toothpick inserted in the center of the cake, comes out clean. 7. Once it is done, let the cake cool down completely. Turn the cake out on a rimmed platter and poke the top of the all over with a fork or a toothpick. Again allow the cake to cool down. 8. Take the evaporated milk, sweetened condensed milk, and the half and half in a medium bowl and whisk together. 9. Once it is well mixed, pour the mixture over the cake. Let it sit for overnight and put it into the fridge. The cake will soak up the glaze. 10. Place the mixing bowl and whisk attachment in the freezer for 15 minutes. Then put the cold whipping cream, vanilla extract and sugar into the bowl and beat until stiff peaks form. 11. 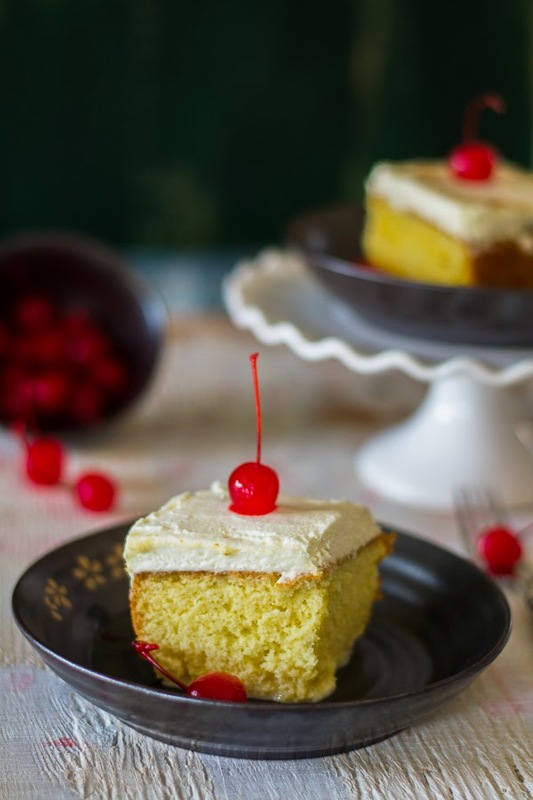 Spread the topping on to the cake, top with cherries and allow it to chill in the refrigerator until ready to serve. Rumela, I saw you post on Chef at Large ... First time here..Loved your space. I am following you now :) The cake looks yummy! That's amazing~ i must say! Love, the milk cake, I think it's one of my favorite cakes ever. The cake looks gorgeous my dear.